It’s Day 7 of Office Girls and the tension is increasing. I like how the drama takes a Taiwanese look at what is called OLs (office lady) in Japanese. But it’s not the stereotypical OL in Japanese context who serve tea and do clerical work. In the Taiwanese version, there are four basic types of OL according to the female characters. The setting is the retail industry so the female characters are not merely serving tea or answering calls. Well, except when they’re doing it for the male bosses. The plot gives an idea though on the inner workings of an office environment where you have an efficient, but plain girl vs an efficient but scheming pretty girl. Sheng Xing Ren – typical office girl who is plain, hardworking and persevering. The dream employee who has dedicated herself to the company she works for and is already happy staying in the background. Zheng Kai Er – the stereotype of the beautiful, scheming woman whose porcelain surface does not match her plastic inner being (obviously, I don’t like her). The type who would do anything to get to the top. Lala – gossipy employee and loyal sidekick who knows practically everything that goes on in the office. Wei Min Na – the career woman who would sacrifice even her personal life for her work. She has yet to make an appearance in the drama and seven episodes already, there’s only been reference of her which makes her a mystery. Then there is Mandy, one of the support cast, who is always quick to criticise her colleagues but as Qin Zi Qi said, doesn’t have anything to show for the five years she has been working in the company. Obviously, the mall prince undercover is in love with his colleague, the plain Sheng Xing Ren. But his old prince syndrome is telling him that Zheng Kai Er is his more suitable partner, though whenever he is with the office beauty, all he does is rant about the office lady. Even a blind man can see through you, Qin Zi Qi xiansheng. Why, even the scheming Zheng Kai Er already knows it. I will bet Qin Zi Qi’s one-month salary of NT$30,000 that this Zheng Kai Er has already figured out from the first episode who “Jason” is. And being the scheming b*tch that she is, she is keeping her cards close to her probably-enhanced-chest so she could bag the golden rice bowl aka her ticket out of the dirty old rabbit she works for. And this naive Qin Zi Qi is being strung along like a dragon kite at the Chinese kite festival. In Day 8, Qin Zi Qi finally falls into the trap that the “lovely, innocent” b*tch has laid out for him. I just know it. Next episode’s preview is heart-stopping. NOOOOOO!!!!! Qin Zi Qi… why you so stupid???? Didn’t you read the writing on the wall??? BU YAO! BU YAO! 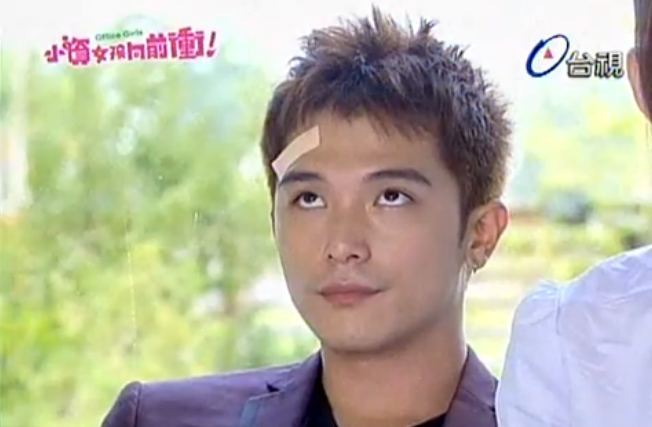 But Roy Qiu… why you so hot?